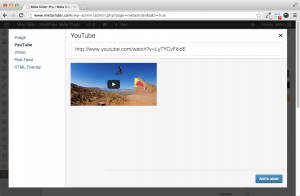 YouTube slides are a slide type included in the MetaSlider Pro add-on pack. Click the ‘Add Slide’ button to launch the Media Manager and select ‘YouTube’ from the left. Paste any YouTube URL into the text input. A preview of the video will load in the space below. Click the Add To Slider button. The Media Manager will close and your YouTube slide will be added to your slideshow. The general tab allows you to configure the parameters used for the embedded video. Enable Auto Play to start the video as soon as the slide is displayed. The Theme tab will let you choose the theme (Dark or Light) and the color (Red or White) for the embedded YouTube video.